I have been on a hunt for the perfect khaki or army green coat. I think I may have found the perfect one from Uniqlo. I am a very old school shopper, I like to touch, feel, observe the clothes and try it on. I've seen a few online but I wanted to find one at a store. Last week, I stopped by Uniqlo to check out a camel coat that I've been seeing in their window for a few weeks now. I ended up leaving with the khaki coat. It's from their recent collaboration with Lemaire. It was quite pricey at $169 if I remember correctly. But it's Lemaire! The material is a soft blend of cashmere and wool. Never touched anything like if before. I really love how soft it is. The cut is slightly oversized. I wish it had buttons. 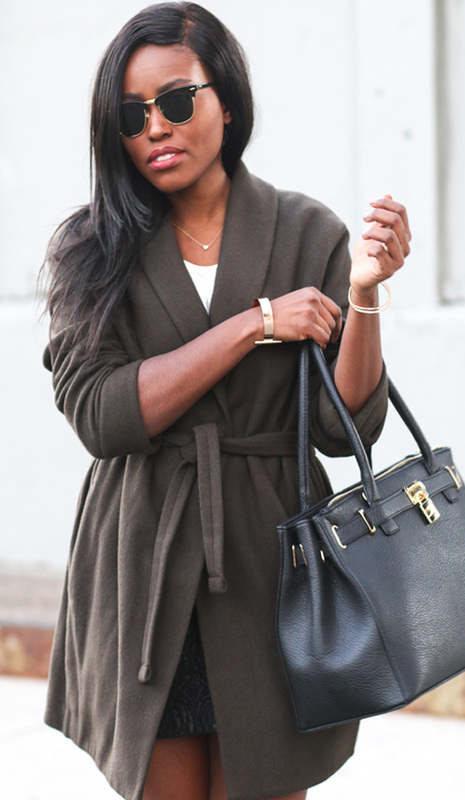 The reason why I've been on a hunt for a khaki coat is because I feel that it is very versatile. I can basically wear it with most things in my closet including my favorite, all white. It's officially big bag season. I was excited to bring this bag back out. I kind of missed carrying my whole life in a bag. These Zara lace up heels are killing the game. I am obbseesd with both pairs that I bought. I feel that this complemented this plain and simple outfit very well. Thank you so much for stopping by. See you very soon.